A stunning vintage-style digital reverb at a price that makes it an essential purchase. Easy, efficient interface. Great-sounding, versatile algorithms. Excellent value. Infinite control adds an extra dimension. Convincing vintage digital emulation. There are a great number of reverb plug-ins on the market and at least one packaged with every DAW, so it's perhaps surprising that so many musicians are still on a quest for perfect plates, hallowed halls and righteous rooms. One theory goes that, because we've grown up on a diet of dodgy old digital reverbs, the ultra-realism of many modern reverbs isn't necessarily what we want to hear. Step up Eos, which is designed to be a simple but effective reverb plug-in with three algorithms - two plate and one hall - that take after the hardware digital reverbs of old. Plate 1 is a mono-in, stereo-out affair, designed to sound like a simple 70s digital plate-emulating reverb, and it does an excellent job. It's clear without being too clinical. Plate 2 is largely more of the same, but it accepts a stereo input - the upshot of this is that you needn't worry about phase cancellation issues with stereo material. Then there's Superhall, which lives up to its name, being a vast-sounding emulation of the kind of digital hall reverb that one would associate with '80s productions. On to the reverb-sculpting controls, then, and first up we have Pre-Delay, Size and Decay, which are displayed numerically alongside a rather beautiful little GUI section that gives a visual reference for the type of sound you can expect. You can manipulate the parameter values directly or manhandle their corresponding GUI elements with the mouse. The Attack control does what you'd expect, although its effect varies depending on the reverb type selection - with the Superhall type, for example, it lends a noticeable 'fade in' to the reverb tail when cranked up. The Diffusion knob's effect is similarly predictable, offering progressive softening of the dispersion of early reflections - this lets your reverb fit into a busy mix or really hammer in sparse sections. Next is the modulation section, which can be used to either add a touch of realism or turn things into a crazy special effect. The filter section of Eos houses standard low- and high-cut filters within a tasty GUI. More interesting is the Multiplier section - often called 'damping' in other reverbs - enabling bass cut/boost and treble cut within the reverberation algorithm. 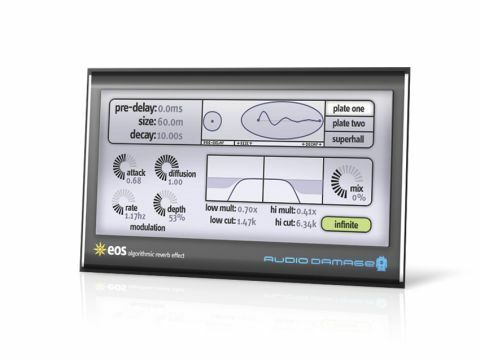 "Eos is designed to be a simple but effective reverb plug-in with three algorithms that take after the hardware digital reverbs of old." Thus, this controls how quickly the treble and/or bass decays in relation to the mid-range. Because the bass can be boosted as well as cut, the low-end can be made to outlast the mids and highs. As with the reverb section, what sets it apart is the slick interface - as you tinker with the levels, the response is shown in a graph depicting the low- and high-cut curves and multiplier slopes. One thing you can't do from the front panel is change the multiplier frequencies - Audio Damage reckons that you'll rarely want to - but if you're really determined, you can alter them by automating a pair of 'hidden' parameters. Finally, there's the Mix knob (but no independent dry/wet levels), and the rather impressive Infinite button, which you may know as a 'freeze' or 'hold' function. In much the same way as cranking the feedback control on a delay can cause sound to quickly gain enormous, overpowering momentum, the Infinite control on Eos can be used for some heavy-build antics. It tends to work best on sparse sounds and will need some automation to make it manageable. So that's about it. Eos is a great-sounding reverb that we particularly love on percussion and have already added to our list of go-to plug-ins for real-world projects. The Superhall setting is great for large-scale, epic sounds, but despite Audio Damage claiming it's the jewel in the Eos crown, we actually think that the plate settings really have the edge - perhaps it's all a matter of taste. Either way, if you're in need of reverb, snap up this bargain right away and you'll be enjoying it for years to come!